The Zoho CRM and Google Contacts integration is a common used sync. Businesses that use this sync notice an increase in productivity because the sales team stays focused on their targets. This is due to the fact that they no longer have to manually keep their contact lists up to date in either apps. It’s also easier to focus on clients knowing that all their information is up to date. Google Contacts and G Suite, don’t have their own team contacts manager. This is a huge headache for administrators who want to be able to manage contacts on a team based level. 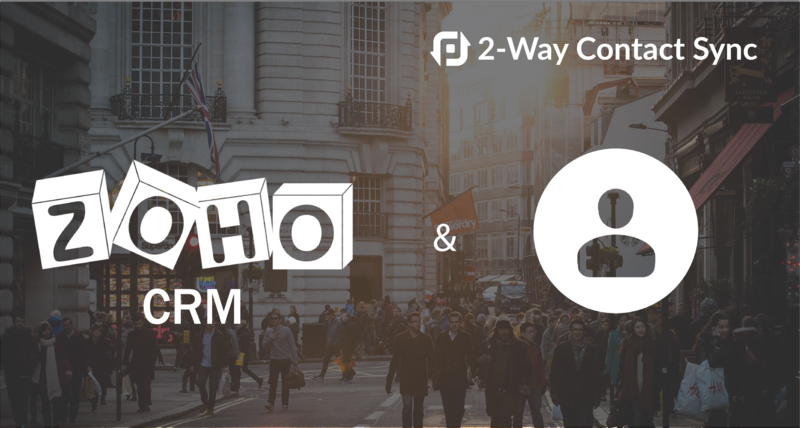 That’s why businesses choose to use Zoho CRM in conjunction with Google Contacts or G Suite because it allows administrators to manage contacts on a team based level. Firstly, choose Google Contacts to start a sync with Zoho CRM. Secondly, you need to authorize your apps. Then it’s time to configure your sync. A two-way real time sync requires two rules which are preconfigured for you. 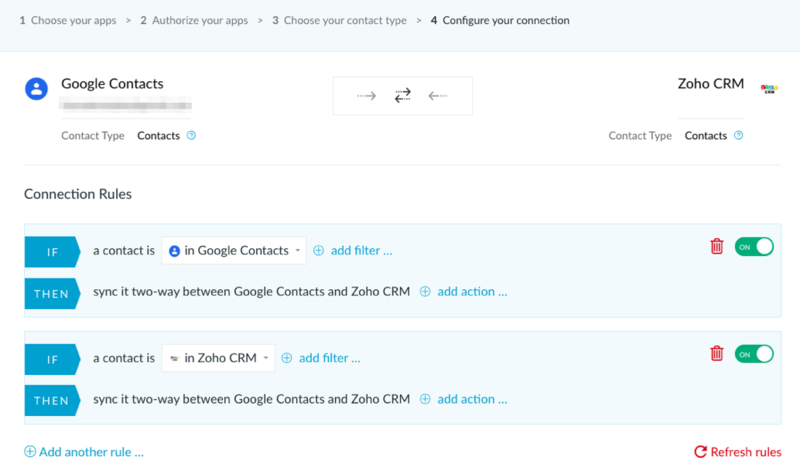 They read “IF a contact is in Google Contacts THEN sync the contact between Google Contacts and Zoho CRM” and “IF a contact is in Zoho CRM THEN sync the contact between Google Contacts and Zoho CRM” this means all contacts in Google Contacts will be synced over to Zoho CRM and all contacts in Zoho CRM. TIP: Click here to find out how to set up a Sync with Google Contacts. A lot of people don’t want to sync all contacts, or they want to segment the contacts into lists or groups. This can be done by configuring rules. 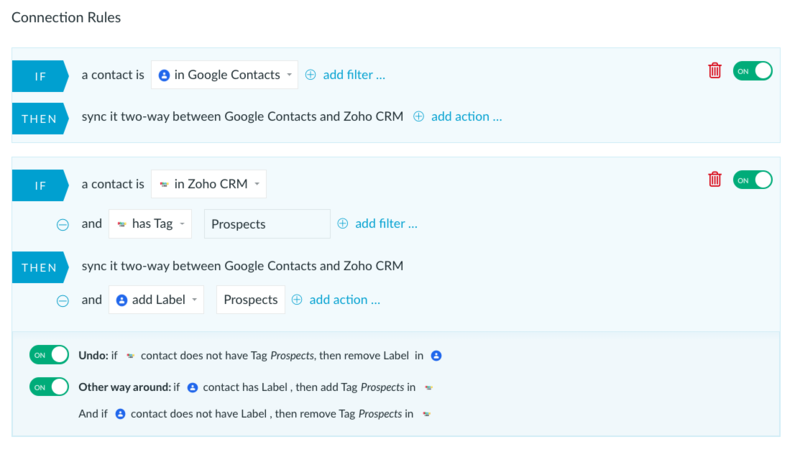 For instance, you can filter your contacts based on their tags in Zoho CRM. Perhaps you want to segment contacts who have the tag “Prospects” in Zoho CRM into a Group called “Prospects” in Google Contacts (you will need to create this group in Google Contacts if you don’t already have one). Create a rule that reads “IF a contact is in Zoho CRM and has the tag “Prospects” THEN sync the contact between Google Contacts and Zoho CRM and add to Group “Prospects’” At the bottom of this rule activate the toggle which reads “Undo if tag does not equal Prospects, then remove from Group Prospects in Google Contacts”. This will ensure your list is kept up to date. But what happens with deletions? Thanks to PieSync’s Teams features, you and your colleagues can sync contacts in Google Contacts or G Suite into Zoho CRM. Duplicates (where the same contact is synced multiple times) are prevented because PieSync first checks to see if no similar contacts have been synced based on email addresses. Want to discover more inspiring combinations? Take a look at our PieSync Guidelines for Zoho CRM users. Elisa has been helping out the Marketing team by creating content on Social Media and sharing customer stories. This easy going Spanish girl, has a great passion for travelling, cooking and has a lot of positive energy she likes to share with us.